Ideally situated in the NE part of the “Pearl of the Caribbean”, the view from the balcony speaks for itself. Literally, the balcony faces the beach, and depending on the season the roar of the waves can mute any conversion. I can only hope to share the wonderful times and conversations that have partaken on the balcony. Upstaged only, by its proximity to the beach. I decided to buy this place after renting the unit below and being enamored by its beach view. Now, I would like to share it with you. The emphasis is on the balcony, and once rented, then you know why the eloquent description. Nonetheless, the condo is well-kept and very accommodating. 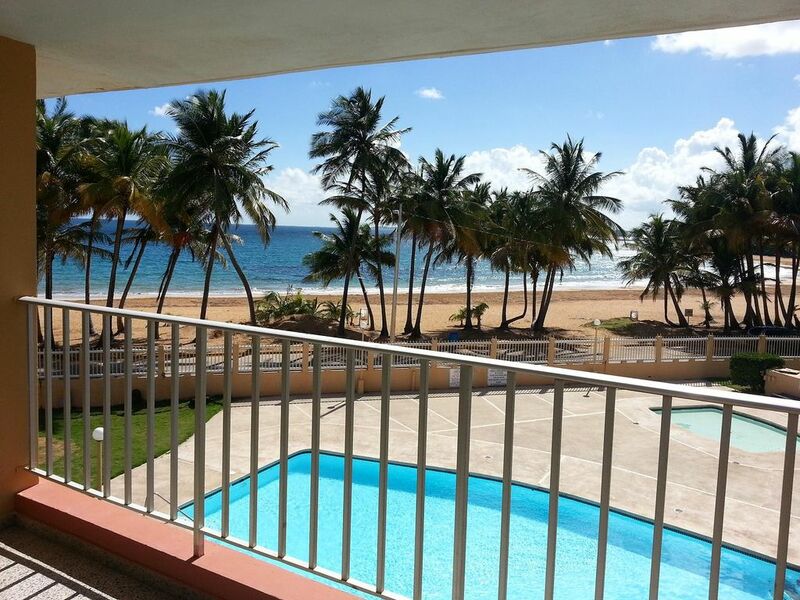 It is located in the city-resort of Luquillo. It is about 25 miles from San Juan (30-45 minutes) and all the bustling city life. It is a perfect gateway to spend with your family away from the hectic routine of the city, yet, within distance of all amenities needed. The condo has three bedrooms and two bathrooms. A total of 6 people can sleep comfortably. The master bedroom has a queen size bed. There is one full-size bed in another. The other has a single bunk bed with a full-size bed in the bottom and top is single, and one adjacent single-size bed as well. The kitchen is equipped with all necessities needed for any home cook meal. Luquillo is filled with activities ranging from all kinds of water activities to hiking in the nearby fabled Yunque (National Rain Forest). There are several large hotels near the area with Casinos and multiple other activities. Hello fellow travelers, I am Arturo and the owner of the condo. Originally from PR, I often return to enjoy all the island's delights. Spending time with the family in a relax and enjoyable setting is one of my pastimes. There is nothing like traveling and having a place that lets you experience the charm of the area. This condo was amazing!!! We had such a relaxing and enjoyable stay. The view from the balcony was awesome!! Arturo was so accommodating, we had a little trouble getting in, which was our fault, but we called and he walked us through it. Would definitely recommend this condo and would love to come back again. I stayed at this beautiful home for a weekend and we absolutely enjoyed it! We were there for a wedding and a friendly getaway. The View from the balcony and sounds of the beach were so amazing!! I would definitely recommended staying here. I will definitely be returning ! Loved it!! Would definitely stay here again!! Excellent Location!! Breathe taking view!! Thank you Arturo for making our stay fabulous!! This is my 2nd time staying here and this place is still awesome! First the owner is pleasant, easy to deal with and very helpful. A short 40 minute drive from SJU airport using the highway and the fun, fun, fun begins. On the way we stop by the Kiosko then to the condo to see what we needed and then to the grocery store across the main intersection. Then we gathered up some beach items and went to the beach across the condo - go to the left where the water is calmer and clearer. Then back to the condo to drink and relax at the porch overlooking the beach. The next day we went to Las Croabas to get fresh lobsters and fish, then to the beach again. During our stay, we managed to visit Old San Juan, Ponce, Guavate, and just mainly sticking to the coastline roads where we enjoyed the scenery. On the way back we took the highway and beeline towards the condo to relax at the porch and plan the next day's adventure. Icacos is such a great beach and bio bay is a must for kayakers. For hikers, El Junque - technically It's free to get in just follow the main road uphill but go to the gate and pay only it you want to go to the Visitor's center, get a tour, map and advice. Frankly just a few dollars fee that goes to upkeep. The condo location is perfect and the condo was clean, tidy and comfortable. I will stay here again and highly recommend this place. Lots to do on this side of the island -beaches, fishing, restaurants, shopping, etc. The condo made it all possible to enjoy this part of Puerto Rico! We have stayed in this condo twice and already have another stay booked. We have been coming to PR for many years and have stayed in different parts of the island. This is a beautiful spot, condo is comfortable and well stocked. For restaurants we recommend, Dos Panza, El Estacion, and kiosk 38. The owner of this apartment is easy to deal with and very helpful if you have any questions. You can't go wrong staying here. It's an amazing place. The beach and everything is close by easy to find and travel. The owner always available if anything comes up. Definitely recommending it.